Visit our stand at Vertikal Days for the latest ground protection innovations. 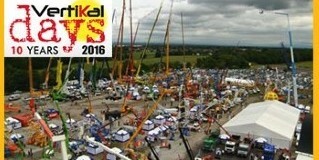 We’ll be demonstrating our latest ground care solutions at this year’s special Vertikal Days 10 year anniversary show. MaxiTrack | MultiTrack | TuffTrak and TuffTrak XT. Vertikal Days is taking place on Wednesday 15th and Thursday 16th June 2016 at Haydock Park Newton-Le-Willows Merseyside WA12 0HQ.